Mataranka, in the Northern Territory, experiences slightly cooler winters than our next nearest mango growing region at Katherine but that’s all it takes to extend our Top End harvest by a few weeks. 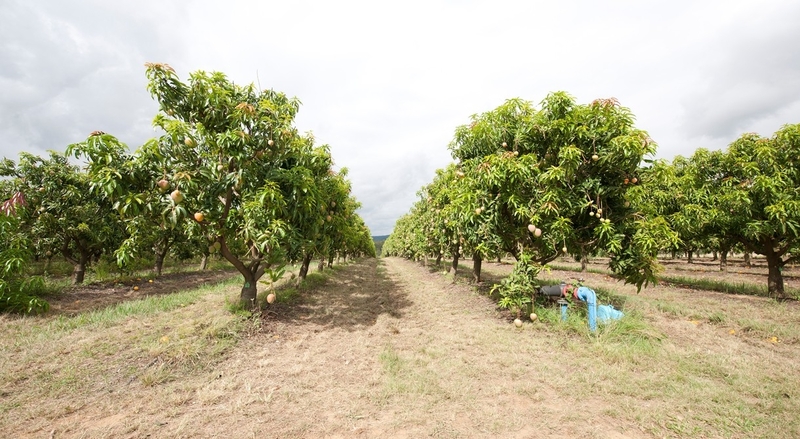 Our Mataranka orchard has some 16,000 Honey Gold mango trees spread over 60 hectares, producing fruit between late November and mid December every year. Established in 2005, the Mataranka farm produced its first commercial crop in 2009. Minimum winter temperatures can be one or two degrees cooler than that experienced at Katherine, approximately 90 kilometres north. As a result, Mataranka trees flower and set fruit about two weeks later than Katherine – perfect timing for back-to-back harvesting. Known as “Never Never” the area became immortalised in Australian folklore when Jeanie Gunn’s autobiographical novel “We of the Never Never” was published in 1902. Mataranka is a geographically flat region dotted with limestone and known for its natural hot thermal springs. Our farm is set outside the tiny Stuart Highway township of Mataranka and is managed by a small team. Seasonal workers are employed to help during pruning and harvesting periods. Picking aids are transported from our Katherine farm for this purpose as infrastructure is minimal. Throughout our Top End growing regions, night picking is standard practice to ensure quality and freshness. When the mangoes are harvested here, they are sent to a packer in Katherine before being distributed nationally.